Resuming from the cliffhanger ending of volume 2, Ichigo Kurosaki finds a Hollow standing over the grave of his mother and Ichigo’s two sisters are in its clutches. However, the growing trouble for the temporary Soul Reaper doesn’t stop with just monsters this time. Charasmatic TV-host Don Kan’onji has a show about ghosts and believes he can free the restless spirits from their Earthly bonds. To make matters worse, a rival for Ichigo has appeared. Classmate Uryu Ishida decends from an ancient tribe of warriors that kills Hollows instead of freeing the souls inside. Uryu’s role as a Quincy makes him a rival for the Soul Reapers and he carries a strong hatred for them. Based on the popular manga series in Weekly Shonen Jump comes Bleach: Volume 3 from Viz Media. With Ichigo and Eikichiro Saidoh putting their battle aside, the two men work together to free Ichigo’s sisters at the start of episode nine. Slicing the tongue holding Yuzu prisoner, Ichigo manages to make it in time to save his sister from becoming a meal. However, the Hollow still has Karin held under its foot and that’s all the Hollow needs to have a hostage. A familiar girl appears and the temporary Soul Reaper is reminded of the person his mom died over; Ichigo saw this girl by the river six years ago. Yes, the Hollow is the one who actually took Ichigo’s mother from the Kurosaki family that day. 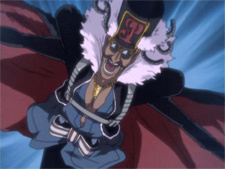 Given the code name Grand Fisher by the Soul Society, the Hollow’s specialty is luring in people with high spirit energy to add to its own power. The battle isn’t just about defeating a Hollow now; it has become far too personal for that. Eikichiro and Rukia assist Ichigo in freeing Karin, but Ichigo continues to pursue the Hollow retreating into the woods, determined to settle the score for taking his mother. Episode ten introduces yet another oddball person for Ichigo to deal with. Don Kan’onji is a popular TV-host whose program seeks out haunted places across Japan so that Kan’onji can exorcise the spirits. Since Don will be at the local abandoned hospital, Orihime gets her classmates excited about going to see the filming of the show in-person that night. Naturally, given his spirit-seeing condition, Ichigo hates this kind of crap reality show, but all of his friends and family are looking forward to it. Bored with the circus act of a presentation, Ichigo watches from far back in the crowd as Don makes his appearance. Rukia spots the grumpy Ichigo and decides to give him some company. Just then, the pair, as well as Ichigo’s regular friends, hears the screaming of something from the hospital. Rukia explains to Ichigo that the soul is bound to the hospital but won’t become a Hollow for awhile, so they can wait on freeing the soul. Ichigo starts to relax when he notices Don’s method to release the spirit is driving his staff into the hole where the heart used to be. Don is unknowingly hastening the trapped soul’s progression into becoming a Hollow. Ichigo and Rukia spring into action only to be trampled by the security guards. Meanwhile, Don celebrates having released the soul bound to the hospital as the tortured soul is actually reconfiguring itself to become a Hollow elsewhere. As Ichigo and Rukia struggle to get free, a cane moves swiftly from behind and knocks Ichigo’s Soul-Reaper-body out of its shell. Mr. Urahara just happened to be in the crowd to watch the show. Free from his own bonds, Ichigo rushes over to Kan’onji, who can see Ichigo in spirit form. Don starts to ask questions, but Ichigo doesn’t have time for this as the Hollow comes crashing down. It can sense their spirit energy and Ichigo needs to get the Hollow away from the crowd before he can dispense with the monster. The final two episodes for this volume introduce a new trouble for Ichigo Kurosaki. 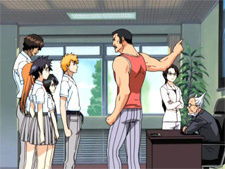 We start with sensei Kagine quite displeased with Kurosaki; after all, Ichigo and Rukia have dishonored the entire school on nationwide TV by hopping the fence during the taping of Don Kan’onji’s show. However, the principal doesn’t seem as concerned as the teacher. Each of Ichigo’s friends quickly make up an excuse to try and get away from the forthcoming punishment, but Rukia manages to come up with a sad story to distract Kagine long enough for all of them to escape. Walking across the school grounds, Rukia’s Soul Pager recieves a message about a Hollow being close by. She grabs Ichigo and they head off, leaving Orihime and the others wondering if the two are secretly dating. The pair reach a spirit hiding in an alley, but the Hollow is nowhere to be found. However, watching from overhead is a mysterious man dressed in white. A second order doesn’t pan out with a Hollow to defeat, leading Rukia to consider that her Soul Pager might be broken. Yet, walking down the street is the mysterious person who has decided to confront the two Soul Reapers. Uryu Ishida is a Quincy and he hates Soul Reapers with a passion. Uryu announces his plan to kill all of the Hollows before the Soul Reapers, using his special spirit arrows before leaving them. 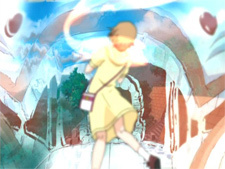 The next day, Rukia decides to find Uruhara for some information on Uryu’s people and tries to get her Soul Pager fixed while Ichigo goes to school. Mummbling to himself trying to recall the name of the man from the night before, Ichigo stumbles into Orihime, who happens to know exactly who he’s talking about. 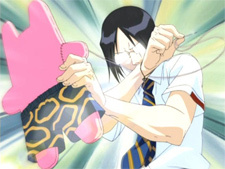 Uryu Ishida is the number-one student in their class and a member of the Handicrafts club. Orihime takes Ichigo over to the club to check in on Uryu. Although he’s skilled with the needle, Uryu seems to scare the girls in class even though he helps with whatever they need. With the Quincy so close, Ichigo decides to follow Uryu to learn more about him. 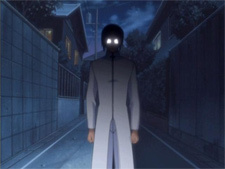 However, Uryu quickly confronts Ishida on the streets, pointing out that he can detect the spirit ribbons of all people. Ishida issues a challenge to Ichigo: he who can destroy the most Hollows in twenty-four hours will be the victor. And Uryu Ishida just happens to have something like an irresistable bait that will draw the Hollows to the city. Ichigo tries to get Uryu to stop this insane game that risks real lives, but Uryu is sure he’ll defeat all the Hollows before anyone is in danger. But the trouble doesn’t stop there: Hollows are attracted to targets with high spirit energy and a lot of Ichigo’s friends and family are beginning to shows signs of connectivity with the spirit world. Bleach has found a steady place to build the storyline from now and one of Ichigo’s friends being able to properly assist in the battles ahead with the Hollows will be a nice addition to the coming episodes. However, I am starting to get a tad burnt-out on the habit of stretching plots across two and three episodes at a time just to make new cliffhangers. Unlike the previous two volumes, the hardsub sign-translations are not present on this disc, so that’s a hopeful sign they’ve been dumped completely. The Japanese cast carriess a steady batch of good performances, but nothing really stands out in these episodes as something stunning to mention. The English production from Studiopolis hasn’t made much progress forward or backwards with this volume in terms of acting. The lead cast of Johnny Yong Bosch (Ichigo) and Michelle Ruff (Rukia) have found the nitch for their characters, but the supporting cast can still be mixed at times with the occasional cheesy voice used for a character. Derek Stephen Prince fits decently for Uryu Ishida, but further episodes will hopefully help strengthen the performance. The still more dangerous problem for the English dub is the script’s habit of wandering off with small dialogue changes. Bleach: Volume 3 is starting to hit its stride as a series to follow. While the early episodes moved a tad too slow for me, this current batch has done a good job in keeping my interest. The video is clean of errors and hardsub-free for the first time. The subtitles are also error-free for this volume. The DVD extras are more production art, the credit-free ending video, and some collectible stickers duplicating the cover and episode titles. Bleach: Volume 3 has done a good job not disappointing me after enjoying Volume 2 and I look forward to Volume 4. The only thing that could help Bleach more at the moment is dumping the multiple-episode cliffhangers and digging out a larger role for the toyetic mascot-character Kon to add to the humor of the series.